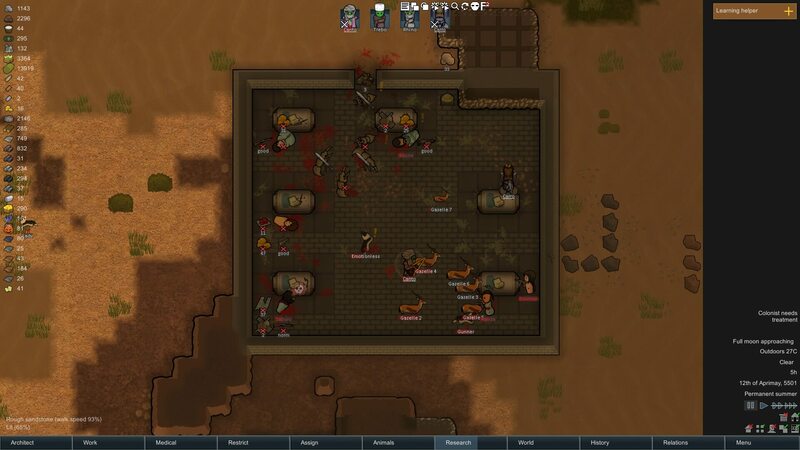 Welcome to the sixth of our RimWorld guide topics, which gets into the gritty business of combat and taking prisoners — if you want to. What’s that you’re saying? We’re missing out something important? The cook’s got drunk and run off into the wilderness brandishing a rifle? Timmy’s stuck down the well? Oh, you’ve got yourself a raid. The Rim isn’t a great place to set up shop. 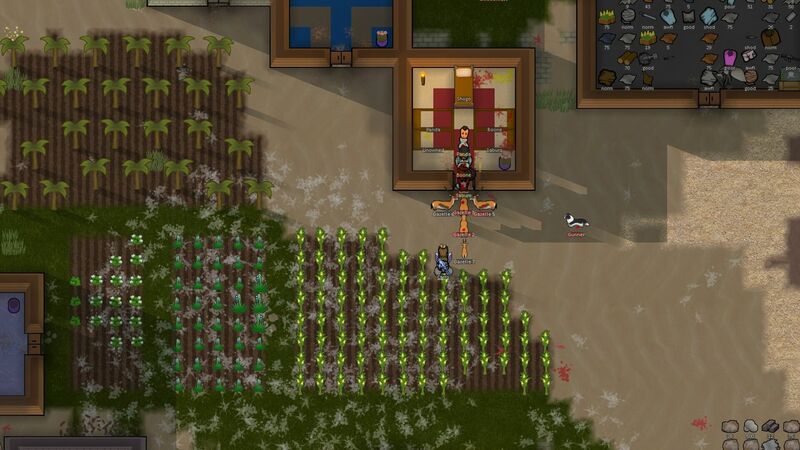 Every now and then, people will come to steal your stuff (even if you only have a stick to share between your colonists) steal your people (even if they’re suffering from malaria) or just outright burn your base to the ground (even if it’s already on fire). How many arrive is based upon your colony’s points — a cumulative score of skills, numbers and items within your local map. No mountains or walls nearby? Trees and stone chunks still make effective cover. Raiders’ tactics vary, but to begin with they usually head straight for your base. If you have plenty of cover around that area, position some colonists behind it in the direction of the attack. Cover can be trees, walls, mountain and stone chunks, though walls and mountains are best. Of course, this is only useful advice for ranged colonists, but still keep your melee users in cover until they’re needed. Just sticking in cover should automatically give you an advantage over approaching attackers, but melee units aren’t as useless as you might think. 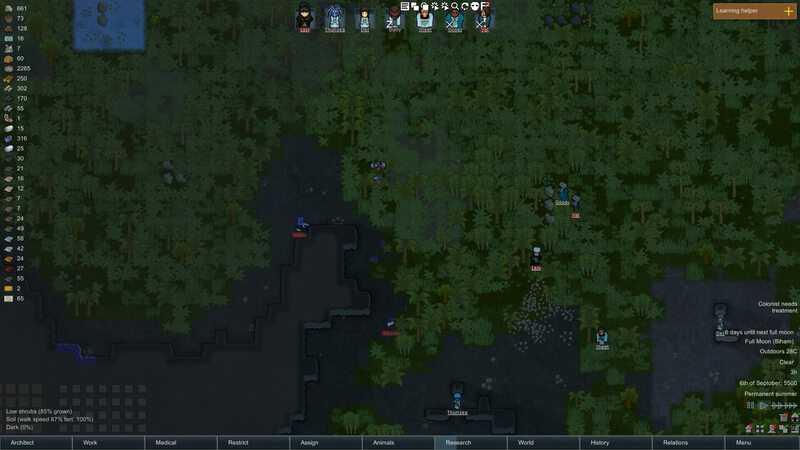 The way RimWorld’s combat system works, every hit interrupts attacks and resets cooldowns. If you hit an enemy often enough, they’ll never be able to get a word in edgeways. In this way, an army of squirrels becomes more than just a laughing stock. We take a break from this RimWorld colony to show you this desert base, with its gazelle army. Later on — and certainly when colossal raids start showing up — it’s a good idea to build more concrete defences. Try to invest resources in a wall surrounding your base, if you can, or at the very least establish some choke points. If you’re using the Embrasures mod, build an embrasure at least every three squares. Once you research gun turrets (and try to get this done as soon as you can), you can connect automatic turrets to your power grid. They’ll pick off anything hostile that gets too close, but don’t put them next to anything precious — they explode up to one square away when destroyed. Others have made some truly ingenious and horrifying defences in RimWorld. From corridors that freeze opponents before they reach the door to spiralling tunnels full of deadfall traps, the measures you take to keep your colonists alive is up to you. Gazelle armies also make keeping prisoners in their cells an awful lot easier. So you’ve whacked a raider on the head enough times to drop ‘em, but what’s that — they’re still breathing? Oh. Well, this is awkward. You could leave them to die out there in the wilderness, which is the best plan if you’re short of resources, but not so good if you have a conscience (oh you poor, unfortunate soul). Some of them might rarely recover from this and start wandering around, as well. Alternatively, why not speed up the process with a few more blows to the head? Make sure to strip them first, as their clothes can still be worn all sold (unless they die in them, in which case they lose value and make anyone who wears them sad). Dead enemies are the most convenient enemies, but sometimes you just need extra manpower. Really though, you’ll want to capture them. 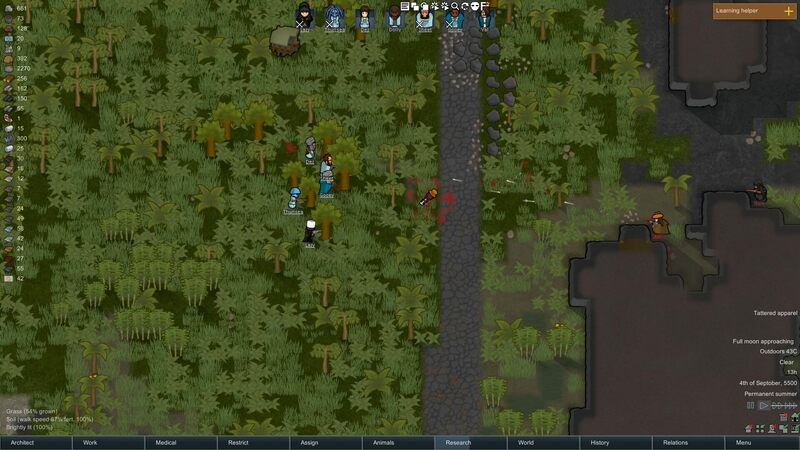 To do this, select a colonist, right-click the raider and pick the capture option. You can only do this if you have a prison, so either make sure you’ve built one or dump a prisoner bed in a room you don’t care about. Don’t dump it in the kitchen, or you won’t be able to cook, or the freezer, as they’ll get hypothermia, or the storeroom, where they could pick up any weapons lying around. 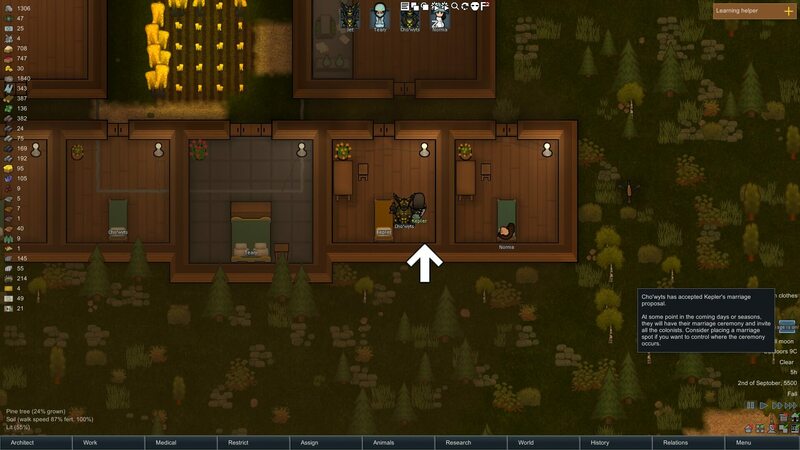 Once you have them safely tucked away, your doctor should tend to them just as for your other colonists. If you don’t want to use valuable medicine on them, you can select the level of medical care they receive in their Prisoner tab above their info panel. Doing nothing will let them stew in the misery of their own failure with only food, medical care (or not) and their inmates for company. This is only really useful if you’re only keeping them for execution, organ farming or medical training. Yes, you can harvest them for spare parts, but they die as soon as you remove an organ, so either keep them around or maintain a trustworthy organ freezer. Medical training just means you give them peg legs for practice, whether you need to or not. I always forget to exercise those two options. If your prisoners are particularly stubborn, they might just remain in prison for years — even if they decide to marry your colonists. You can give them a friendly chat as well, which is more the vein you want to follow if you’re going to release them eventually. Releasing members of certain factions gives a valuable +15 relationship boost, so you can heal and release tribespeople early on to get their friends off your back. If you don’t want a prisoner anymore, or if they went berserk and ripped your favourite puppy’s leg off (true story), you can execute them. This grants a debuff to all your colonists for a while, so use it sparingly — though its effect is decreased if the Prisoner tab says they’re considered guilty (make sure to kill them before the timer runs out). Finally, and best of all, you can recruit them. Sometimes you get an amazing prisoner with skills high up in the teens. They’re incredibly difficult to recruit but worth keeping around for years just to recruit. Some of our colonies have permanent residents, but most are made from around 50% prisoner recruitment, so it does pay off.